Gaiden Shinji was a Redguard hero of the First Era and the leader of the Order of Diagna, who was killed during the Siege of Orsinium. He also founded the Arena in the Imperial City, and was its original Blademaster. He is best known for his famous proverbs such as "the best techniques are passed on by the survivors" or "honor wears the face of your next opponent". The combatants of the Arena refer to him in a manner most would reserve for gods, often saying things like "by Shinji", "Shinji be with us", and "for Shinji's sake". Gaiden Shinji played a crucial role during the Siege of Orsinium. In 1E 948, King Joile of Daggerfall sent him a letter, which proposed a joint attack on the Orc capital city. Agreeing to provide aid, an alliance was formed between the Order of Diagna and the armies of Daggerfall and Sentinel. The armies amassed and began a campaign for the destruction of Orsinium. During the campaign, the Breton armies of Daggerfall, the Redguard soldiers of Sentinel, and the Yokudan Order of Diagna invaded the Orc homeland. The Orcs gave much resistance and proved themselves to be fearsome and brutal warriors, just as they did in the past. However, King Joile already planned to betray the Redguards and invade Hammerfell after having destroyed Orsinium. He and his Reachman general, Mercedene of the Winterborn, tricked the Orc hero Baloth Bloodtusk and his Savage Sons, who initially did not take part in the war, to join King Golkarr of Orsinium. Afterwards, he manipulated Shinji into having a duel with Bloodtusk over Orsinium's fate. During the duel, Mercedene ordered Joile's archers to kill both combatants, effectively removing the most powerful warriors of both Orsinium and the Order of Diagna for Joile. Even before Orsinium was finally destroyed in 1E 980, King Joile executed his plan of invading Hammerfell, but he was defeated and killed at the Bangkorai Pass by the Ansei warrior Makela Leki. Shinji always wanted to be buried wherever he would fall, so Bloodtusk's brother Rakoug and Shinji's friend Lord Trystan decided to build them both a tomb in western Wrothgar. The tomb became known as Honor's Rest, and was rediscovered in 2E 582 by a pair of scholars, Lozruth the Orc and Sharela the Redguard. With the help of the Soulless One, they managed to unseal the tomb, and experienced visions of the last moments of Shinji's life during the Siege of Orsinium. A Breton nobleman, he was the Imperial consort of Katariah after the death of Pelagius Septim III. With her, he was the father of Uriel Septim IV, also known as Uriel Lariat. Lariat's lack of a close connection to the Septim bloodline led to lingering sedition against his son's 'illegitimate' rule. His surname is spelled "Lariate" in one source. King of Wayrest in the Second Era, and the last member of the Gardner dynasty, descended from a merchant prince who was first proclaimed king. He expanded the city's walls and fortifications, allowing it to survive a 57-day siege by Durcorach's invading hordes in 2E 541. Wayrest's forces were instrumental in defeating the Reachmen, and in the aftermath, King Gardner joined with several other Breton kingdoms in signing the first Daggerfall Covenant, a pact of mutual defense. Wayrest thrived for many years afterwards, until the king was suddenly felled by the Knahaten Flu along with his entire family, ending the Gardner dynasty. He was succeeded by Emeric, of the Cumberland Dynasty, who would go on to form the second Daggerfall Covenant which vied for the Ruby Throne during the Interregnum. Garridan Stalrous, Knight-Errant of Farmantle Glens, was a famous knight who lived some time in the late Third Era. He is best known for his failed quest to retrieve the Everflow Ewer, which resulted in his death and the creation of Garridan's Tears. Archmage Gauldur was a powerful and renowned conjurer who lived in Skyrim during the opening days of the First Era. His aid and counsel were sought by many. A major source of his power was his magical amulet. Though Gauldur was wise, wealthy, and honorable, his sons Jyrik, Mikrul, and Sigdis Gauldurson resented living in their father's shadow. They killed Gauldur in his sleep and split his amulet between them. Consumed by power, the three brothers laid waste to the surrounding villages until High King Harald sent Archmage Geirmund and a company of battlemages to stop them, which they finally did after a great effort and many casualties. Because of the destruction caused by Gauldur's family, King Harald ordered the Gauldur name struck from all historical records. But despite this age-long campaign to wipe out all mention of Gauldur, whispers of the legend survived, although bards still refused to tell the tale four thousand years later. For more information, see the lore article. The "Lich of Mournhold", a powerful sorceress who was condemned for studying and practicing forbidden magics. She was laid to rest in the ruins of Old Mournhold, but she cheated death and became a lich. During the Planemeld, Relvel was summoned by Molag Bal to protect a Dark Anchor. However, she was banished back to her tomb by the Fighters Guild and the Anchor was lifted. Centuries later, in 3E 427, her tomb was unsealed by a curious adventurer. She then attempted to spread the Crimson Plague, a disease which was thought to have been stamped out in the Second Era, throughout the city of Mournhold by infecting rats. The lich was destroyed by the Nerevarine before the disease could spread to more than a few people. She was the original owner of the Robe of the Lich. Eldest son of Uriel Septim VII and Caula Voria and crown prince of the Empire. An able heir to his long-ruling father, he had taken over many administrative responsibilities in the years leading up to the Oblivion Crisis. 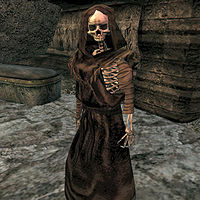 Geldall was assassinated by Mythic Dawn agents at the age of 56, in a coordinated strike against the Emperor's family. One of the last known Snow Elves to exist. He and about a hundred other Snow Elves took refuge from the Falmer and Nords in the massive yet well-hidden Chantry of Auri-El, but time and Falmer attacks dwindled their numbers to only two, Gelebor and his brother Vyrthur. Gelebor believed his brother had been taken and corrupted by the Falmer. However, Vyrthur had actually contracted vampirism from an initiate, and had started a plot to cause Auri-El as much suffering as he could. Gelebor's duty as Knight-Paladin was to guard the wayshrine at the Chantry of Auri-El in the Forgotten Vale, and he stayed there for millennia. When the Last Dragonborn and Serana went to the Vale in search of Auriel's Bow, Gelebor agreed to help, but first demanded that they kill Vyrthur. After the deed was done, he helped them with the bow and stayed in the Inner Sanctum of the Chantry, determined to continue his service to Auri-El for the rest of his days. Gellir was a High King of Skyrim in the First Era. Little is known about him or his reign, except that he ruled at least several decades after King Harald, whose reign ended in 1E 221. He led the Nords to conquer several Dwemer city-states in the province, though the Dwemer would retake them about a century later. Master Gilvas Barelo, Abbot of Holamayan, was the head of the secret order of Dissident Priests circa 3E 427. In other words, during the fruition of the Nerevarine Prophecies, he was the most prominent skeptic of the Tribunal Temple's explanation of how the Tribunal gained their divinity and the events surrounding their rise to power. The Nerevarine came to him to learn more about the crisis Morrowind was facing. Barelo helped the Nerevarine find and interpret the Lost Prophecies of the Ashlanders in order to understand how to fulfill them and defeat Dagoth Ur. Gilvas saw the return of Saint Nerevar as the last, best hope to ending the threat posed by Dagoth, and understood that helping the Nerevarine do this was the only way to end the persecution of the Dissident Priests and advance their beliefs. Following the defeat of Dagoth Ur, the Temple attempted to make amends with the Dissident Priests and re-integrate the estranged order. With the disappearance of the Tribunal and the events of the Red Year, the Dissident Priests seized power in the early Fourth Era and formed the New Temple, although it is unknown what role Barelo played in these affairs. The Dean of History at the Bards College in Solitude in and around 4E 201. He researched and taught musical history at the College, and was reportedly instrumental in saving the annual festival known as the Burning of King Olaf when Jarl Elisif the Fair planned to have it discontinued. Giraud compiled the popular song book Songs of Skyrim. The ruler of Orsinium during the great siege in 1E 950. After bolstering his army with fleeing refugees from Hammerfell, he attempted to broaden Orcish holdings. He sought to capture the Bjoulsae River and force the kingdom of Wayrest to provide compensation for its services. Naturally, this did not settle well with their neighboring kingdoms, especially the Kingdom of Daggerfall. King Joile of Daggerfall allied with Gaiden Shinji of the Order of the Diagna and mounted a joint attack on Golkar's kingdom. Eventually, after a 30 year siege, the allied forces breached Orsinium and overran the city. Legend says Gaiden Shinji himself killed Golkarr. Gor Felim, using the pseudonyms Marobar Sul and Anthil Morvir, was a playwright known for writing "penny dreadful romances", light entertainment for the elite of the old Imperial capital. He lived in Cyrodiil during the Interregnum, and very rarely left the capital. With the invented identity of Dwemer scholar Marobar Sul, in 2E 670 he published a series of seven books about the Dwemer. The series was presented as serious scholarly work, but in fact featured very few genuine Dwemer tale, being mostly just recast Ashlander, Argonian, or Nibenese peasant tales. 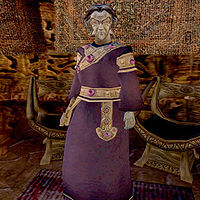 The series was debunked during the scholarly renaissance of the Third Empire, as early as the reign of Empress Katariah, but it still greatly influenced the popular image of the Dwemer in the eyes of the common folk of Tamriel. An emperor of the Alessian Empire. His coronation in 1E 461 was a somber ceremony, in accordance with the rules of the Order, but still attended by most famous figures of the day. One of the guests, High King Kjoric the White of Skyrim, would later rebel against him, and Gorieus' forces killed him in the Battle of Sungard. His military defeat at the hands of King Rislav Larich of Skingrad in 1E 478 began the downfall of the Alessian Empire. King Gortwog gro-Nagorm, Warlord of the Orcs (also titled "Lord of Orsinium" and "King of Orcs and Warlord of the Subterranean Realms") was the ruler of the Orcish people in High Rock in the late Third Era and chieftain of the Minat Orc tribe. He is remembered as a skilled diplomat and a political genius. The Orcish race had been homeless for centuries when Gortwog founded the independent kingdom of Nova Orsinium in 3E 399. Gortwog set about gathering dirt on his rivals to bolster his political situation, and in the process bought a stolen letter written by Emperor Uriel Septim VII. It had been sent to the then-Queen Mynisera of Daggerfall, but had never reached her. The release of this letter contributed directly to events which culminated in the Warp in the West. Following the "Miracle of Peace", his kingdom had expanded to control much of the Wrothgarian Mountains as well as valuable coastline along the Bjoulsae River. By 3E 433, the Elder Council recognized Gortwog as king, and Orsinium as a county of High Rock, though portions of the kingdom extended into Hammerfell. A powerful Sorcerer-Lord and Archmagister of House Telvanni. From his tower in Tel Aruhn, the site of Vvardenfell's largest slave market, Gothren lead the Telvanni council with an iron grip. Highly distrustful of any outsiders, he refused to recognize the Nerevarine as the Hortator, leaving the Nerevarine with no choice but to kill him. King Gothryd was born in 3E 381 to King Lysandus and Queen Mynisera of the Kingdom of Daggerfall. He became king upon the death of his father during the War of Betony. Gothryd was married to Princess Aubk-i of Sentinel following the war, though contemporary accounts paint drastically different pictures of his actions during the Battle of Cryngaine Field and relationship with Aubk-i. During King Gothryd's reign, the kingdom's borders expanded greatly due to the Warp in the West, and he was directly involved in events leading up to the phenomenon. Ruler of Reich Gradkeep in High Rock. As a neutral party, he attempted to negotiate a peace treaty between Sentinel and Daggerfall during the War of Betony. The treaty was rejected, however, and in the violent aftermath Graddock and nearly his entire family were killed. His cousin was elevated to the throne, and renamed the lordship Anticlere, after his ancestral home. The Gray Fox, a mysterious master thief, had been the leader of the Thieves Guild in Cyrodiil for three hundred years by the time of the Oblivion Crisis. Although some doubt his existence, it was commonly believed that he was a single person, while in fact a series of different people had actually held the title throughout the years. The persona of the Gray Fox is created by the Gray Cowl of Nocturnal, which was originally stolen from Nocturnal by Emer Dareloth, the first Gray Fox. Nocturnal cursed the cowl to steal the identity of the wearer. Once a person dons the cowl, the curse transforms them into the Gray Fox and their original identity is lost. The cowl had been passed from one guildmaster to the next, preventing the guildmaster from appearing in public due to the infamous reputation of the Gray Fox. In 3E 433, Hieronymus Lex, a Watch Captain of the Imperial Guard, began a personal vendetta to bring the Gray Fox to justice, although the Thieves Guild eventually conspired to put an end to his hunt. The current Gray Fox, previously Count Corvus Umbranox of Anvil, had spent 11 years attempting to break Nocturnal's curse, and eventually succeeded. His best thief stole an Elder Scroll from the Imperial Palace, and used its power to re-write history. Without the curse, the Thieves Guild had flourished, and the Cowl's power to hide one's identity could be fully manipulated. The persona of the Gray Fox continued to lead the guild, with the Cowl being passed down from the redeemed Count Umbranox to the master thief who aided him. Prince Greklith of Sentinel was the son of King Camaron and Queen Akorithi, and brother of Aubk-i and Lhotun. Greklith became heir to the throne of Sentinel following the disappearance of their eldest sibling, Prince Arthago. Greklith died of a plague near the end of the Third Era. Greywyn Blenwyth was an infamous vampire and the founder of the Crimson Scars, a splinter faction within the Dark Brotherhood. He sought to eventually infect the entire Brotherhood with vampirism, but he was betrayed and the Crimson Scars were destroyed. Greywyn went into hiding, but was eventually tracked down by the Dark Brotherhood and assassinated. He was devoted to the worship of Sithis, and was likely a member of the Cyrodiil Vampyrum Order. Before his death, Greywyn gave ownership of his lair, Deepscorn Hollow, to the Champion of Cyrodiil, a long-lost relative. A famous Orcish champion who lived in the First Era before Orsinium was founded, traveling to secure territory for the ostracized Orcish people to live. Lord of Sollicich-on-Ker, a town on Summerset Isle, in the Second Era. The future Archmagister Vanus Galerion was born there as a poor serf, but was taught to read by his father, a forbidden act at the time. Upon being discovered, the book smugglers, including Galerion's father, were executed by Lord Gyrnasse and left to hang in the sun for weeks. This page was last modified on 25 December 2018, at 16:55.